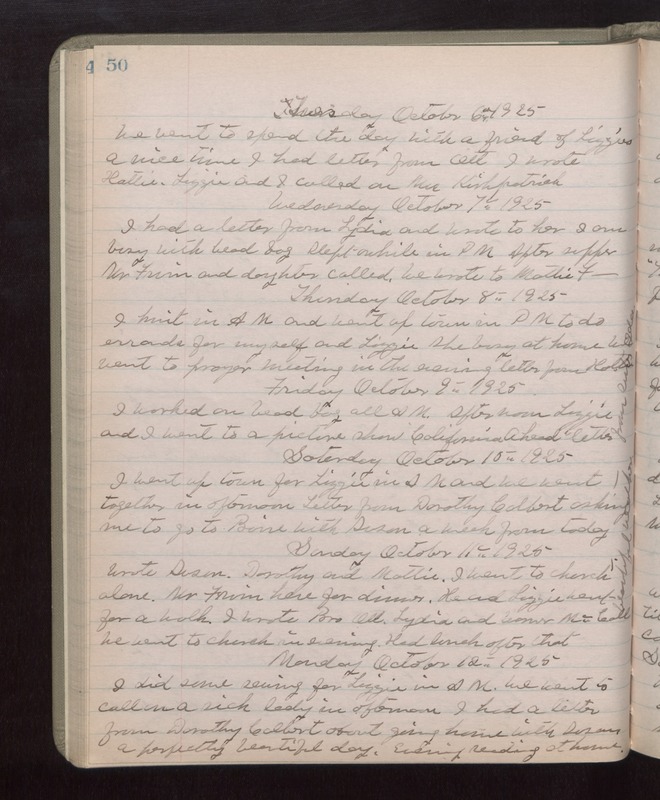 Tuesday October 6th 1925 We went to spend the day with a friend of Lizzies. A nice trip. I had a letter from Ott. I wrote Hattie. Lizzie and I called on Mrs Kirkpatrick. Wednesday October 7th 1925 I had a letter from Lydia and wrote to her. I am busy with bead bag. Slept awhile in PM. After supper Mr [Fruin?] and daughter called. We wrote to Mattie F--- Thursday October 8th 1925 I knit in AM and went up town in PM to do errands for myself and Lizzie. She busy at home. We went to prayer meeting in the evening. Letter from Hattie. Friday October 9th 1925 I worked on bead bag all AM. After noon Lizzie and I went to a picture show "California Ahead." Letter from sister Ida. Saturday October 10th 1925 I went up town for Lizzie in AM and we went together in afternoon. Letters from Dorothy Colbert asking me to go to Boise with Susan a week from today. Sunday October 11th 1925 Wrote Susan, Dorothy and Mattie. I went to church alone. Mr Fruin here for dinner. He and Lizzie went for a walk. I wrote Bro Ott, Lydia and Warner McCall. We went to church in evening. Had lunch after that. Beautiful weather. Monday October 12th 1925 I did some sewing for Lizzie in AM. We went to call on a sick lady in afternoon. I had a letter from Dorothy Colbert about going home with Susan. A perfectly beautiful day. Evening reading at home.